The Govs (3-2) saw the tournament host get out to a 9-0 advantage after four innings but put together a five-run fifth inning to get back into the contest. Kelsey Gross would get the inning started with a home run, her first collegiate round tripper, followed by a single by Brooke Pfefferle and a walk to pinch hitter Victoria Eccleston. A groundout later, Kacy Acree would drive in Pfefferle, with a single to center, making it 9-2. Lexi Osowski would then hit the Govs second home run of the inning, a three-run blast over the left-center field fence to cut the deficit to 9-5. 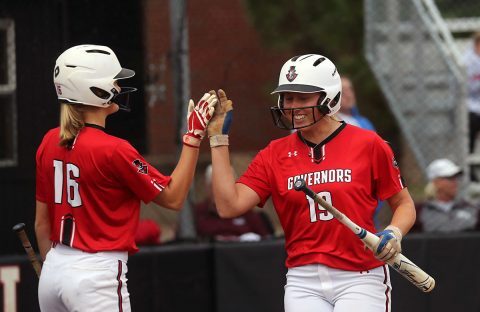 But that would be as close as the Govs would get, as the Blazers (4-2) added singles runs in the fifth and sixth to push its lead out to 11-5 before the Govs picked up their final run of the game, in the top of the seventh, on a single by Carly Mattson to score Osowski for the 11-6 final. Mattson, Gross and Acree all finished the contest with two hits each to lead the Govs. Kacy Acree, Danielle Liermann and Lexi Osowski reached base in all five games of the opening weekend. Morgan Rackel’s one strikeout on Sunday gives her 219 in her career, tying Lydia Money-Gunn for seventh all-time in school history. Kelsey Gross’ eight putouts at first base were a career single-game high. Austin Peay State University Softball is off until next weekend when they travel to Lafayette, LA to play in the 33rd Annual Louisiana Classic.